All the savoury recipes in this menu come from the gorgeous book Jerusalem, however, many of the recipes from the book seem to have been pretty widely published over the net - by bloggers, in newspapers, on forums and so on. (For whatever reason, authors Yotam and Sami don't seem bothered by it - and as far as I can tell, it doesn't seem to have dented their immense popularity! If anything, I think it's helped spread the word.) Having not made any adaptations to their recipes on this occasion, I won't be publishing them myself here, but I've included links to the recipes in the menu above, for your reference. However, I can highly highly recommend purchasing a copy of the book for yourself - it's brilliant! Let's take a look at the meal. The butternut squash and tahini spread sounded like it would be right up my alley, but I found it unrelentingly dense and cement-like, despite my trying to slacken the mixture with extra yogurt, lemon juice, olive oil and water. 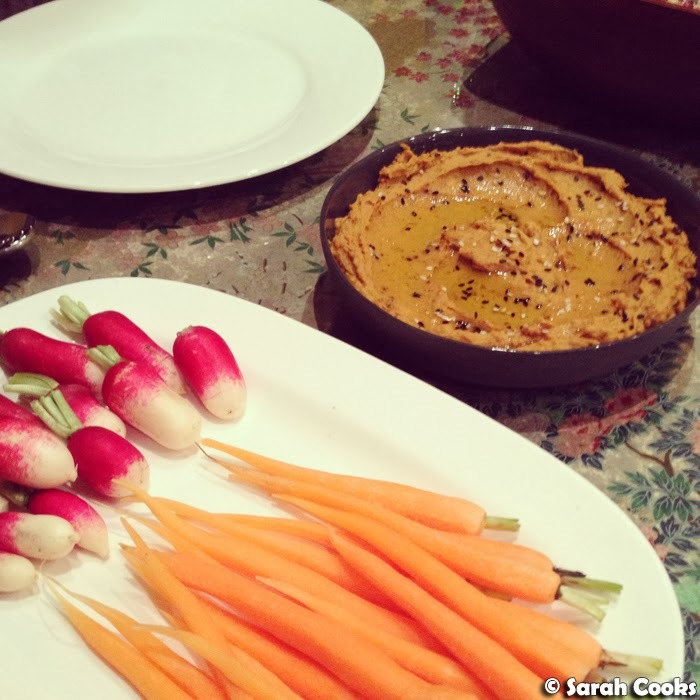 I love the idea of starting a meal with a vegetable dip with vegetable crudités though, but next time I think I'll try one of their hummus or eggplant dip recipes. Don't panic - I didn't bake the bread myself, this time! I just bought some Turkish bread at the supermarket, drizzled it with olive oil and za'atar and heated it through in the oven. 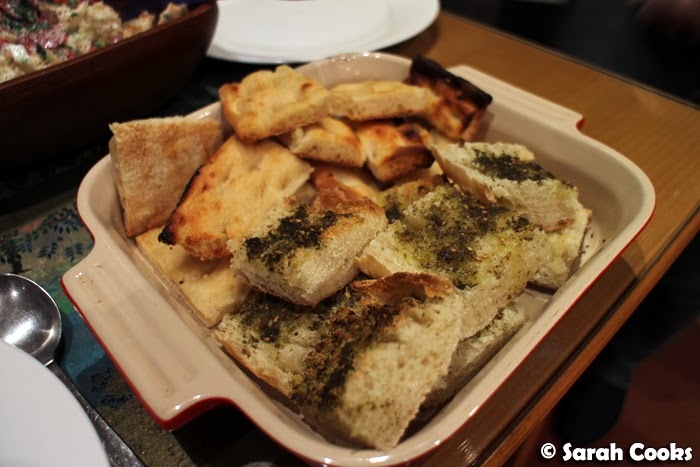 I also picked up a loaf of that fantastically garlicky Afghani bread (I can't remember the brand, but they seem to sell them at larger supermarkets and are very large ovals of thin bread, with lots of oil and a strong garlicky aroma that always escapes the plastic bag in which it is held.) Love it. Na'ama's fattoush is Sami's mother's recipe, and although I was worried a salad containing bread and a yogurt dressing would be very rich, it was actually wonderfully refreshing. I loved the fresh crunch of the cucumber, tomato, radish and red onion, against the soft bread and creamy yogurt. 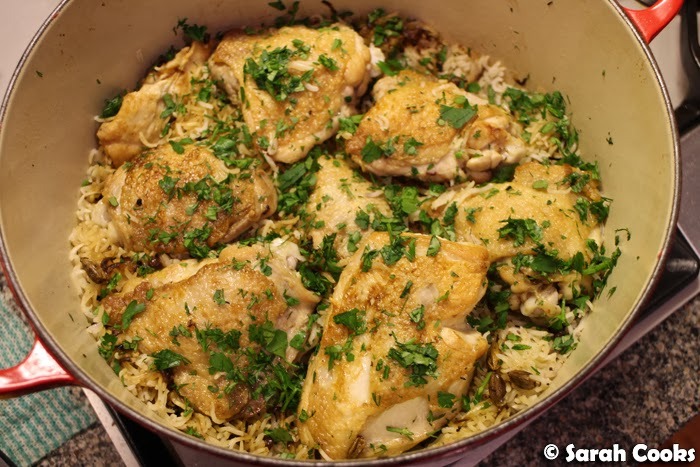 It was a little more work than my usual family favourite: Nigella's saffron-scented chicken pilaf, and there were quite a few more ingredients, but it was so worth it! All the different spices (cardamom, cloves, cinnamon) and herbs (dill, coriander, parsley) create such complex and unusual layers of flavour, and cooking the chicken on the bone makes the rice extra tasty. I had been a bit nervous that the chicken wouldn't cook through, or that the rice would burn, but I followed the directions exactly, and both the chicken pieces and rice were cooked perfectly. Most importantly, Dad loved it, and kept on picking at it straight out of the pot as the evening went on. I had made the crème caramels earlier that day, and unmoulded them to serve. As you can see, they were a bit messy (I just ran a knife around the side of the ramekins and tipped them out into shallow bowls - but think I should have dipped them in hot water first, to loosen the caramel from the bottom and sides). My dad didn't seem to mind though - yay! They were really creamy, with a great bitter edge from the caramel. (I used vanilla beans, because I love them, and everyone seems to think it's a treat seeing vanilla bean flecks). 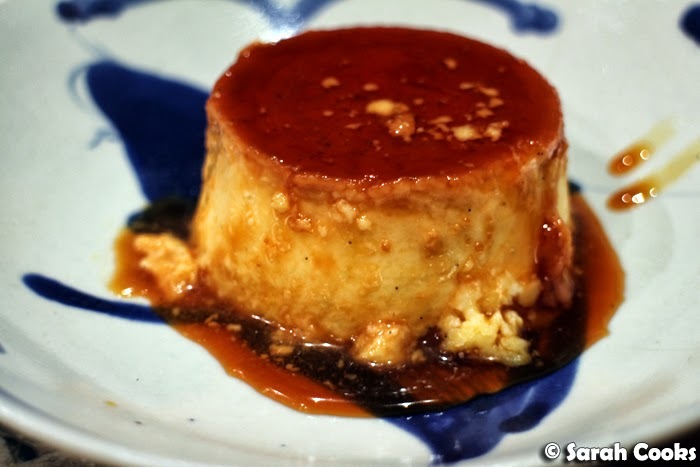 I used a Donna Hay recipe for the crème caramels (recipe here) - her über-styled food photography really gets on my nerves, but I can't deny that she has good recipes for the basics and classics. 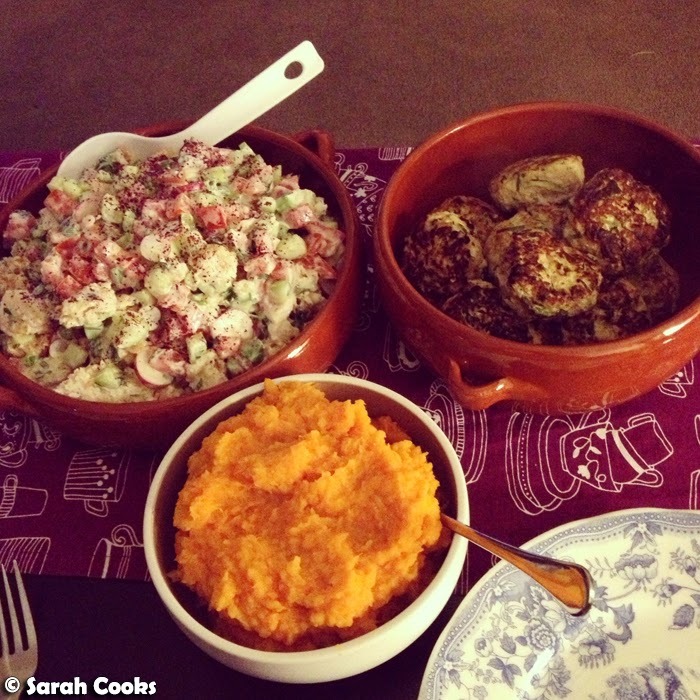 For me, the most impressive dish was, surprisingly, the salad! 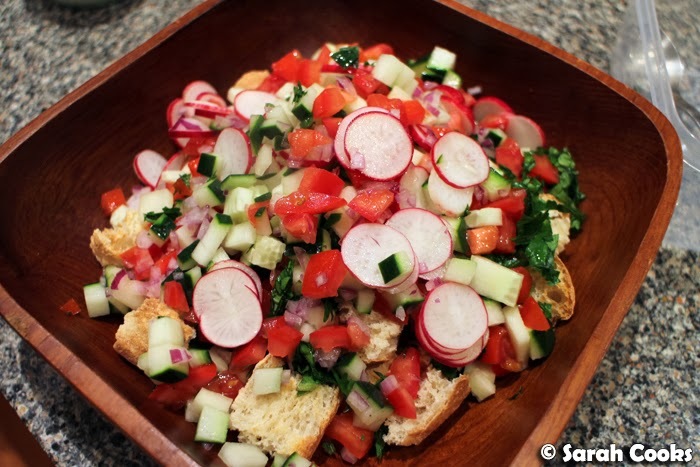 I loved the refreshing yet comforting fattoush so much that I made it again a few days later for a midweek dinner. 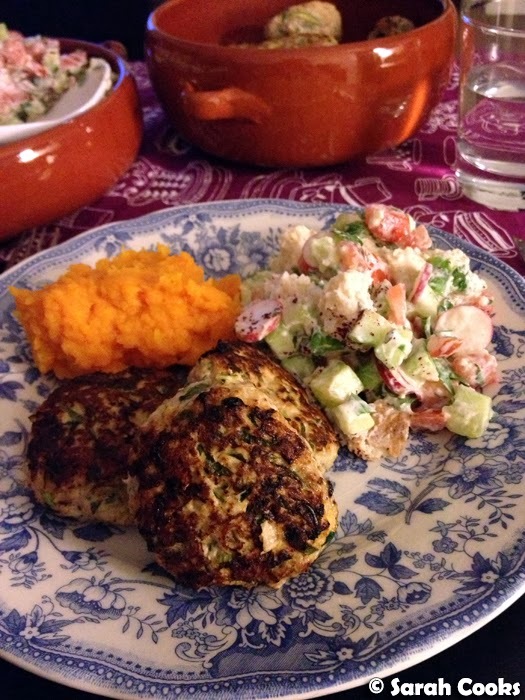 This time, I made it with turkey & courgette burgers with spring onion and cumin (also from Jerusalem) and some mashed sweet potato and butternut squash. So fantastic! And it made fab leftovers for workday lunches too - bonus! What a lovely daughter you are cooking up all of these lovely dishes for your father! :D The chicken looks divine! Oh yum!! I have Jerusalem requested from my library, can't wait to get it! 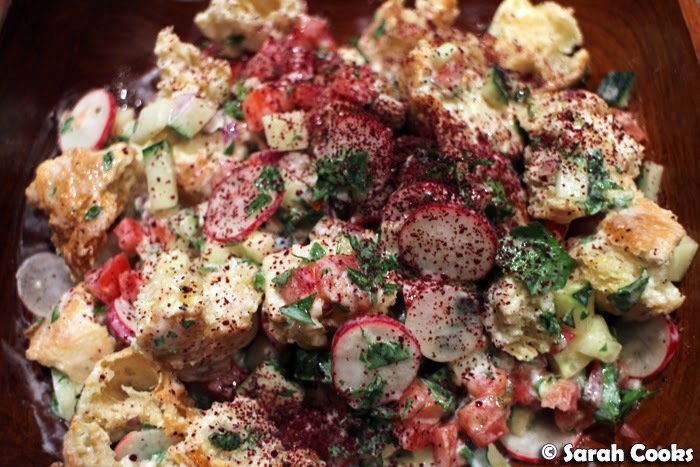 I have made Nigella's fattoush lots of times but will definitely try this one too! I've recently become acquainted with Yotam Ottolenghi's work and man, this guy is a genius! Although I've seen a lot of his recipes on the internet, I still want to get my hands on a copy of 'Jerusalem.' 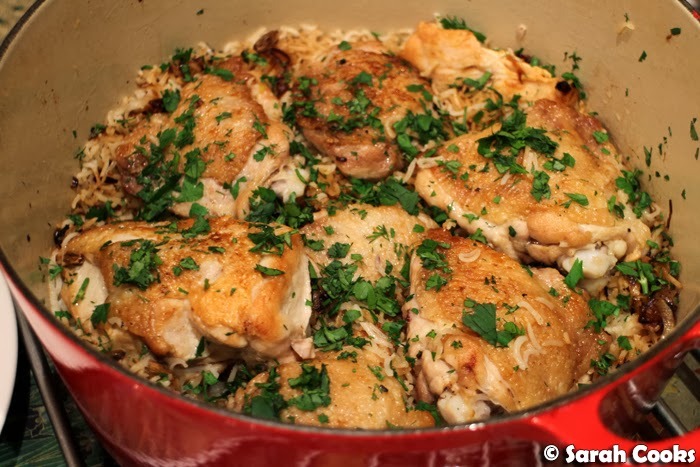 That chicken with cardamom rice recipe sounds amazing.